All of Damian Lillard’s signature basketball shoes come with Bounce cushioning but the Dame 5 has the best Bounce setup in the line. A shoe writer mentions that the black Chinese New Year colorway of the Dame 5 has a sleek outline and appears more stylish than the Dame 4. These Adidas basketball shoes are comfortable straight out of the box. Even the leather upper does not need break-in time. Because of the full tongue and knit collar, a good number of hoopers can wear ankle braces. Several observe that the herringbone pattern works as intended. They say the Dame 5 shoes do not have any issue with clean or dusty courts. A handful of wide-footers report that they truly enjoy the fit of the shoe. The mesh upper of the Adidas Dame 5 looks and feels cheap, claim some buyers. The design and colorways of these Adidas basketball shoes are criticized by many as aesthetically challenged. Some Instagram users complain that the Dame 5 runs long and wide. The Adidas Dame 5 is not your ordinary basketball shoe. It performs just the way Dame Lillard does in his games. It is almost the perfect package for hooping. There might be small issues with the sizing for some buyers,; but if the right size is picked, the support and lockdown are a sure win. It is only the beginning of the year, but some hoopers already overhauled their rotation to include the fabulous Adidas Dame 5. As I mentioned from the start. The adidas Dame 5 is easily an early frontrunner from best basketball shoe of 2019. Yes, it’s very early on in the year. But the shoe just plays well. Pushing aside my dislike for the materials and the overall design, the Dame 5 is solid all the way around. Great traction. Great cushion. Superior lockdown. Wonderful support and stability. The materials might scream budget model, but the performance is what you’d expect out of a premium signature basketball shoe. Whether you’re buy the Dame 5 for full retail price or grabbing a pair for a discount. You should end up liking the hell out of these things. The Dame 5 retails for like $110 or $115. And for that price, I definitely think that these are a great shoe to play in. If you all are interested in picking up a pair, go for it. You guys shouldn't be disappointed. Just keep in mind, you guys may run into the issues that I did with the traction where at the beginning, I thought the traction was abysmal. Like I was shocked that the herringbone didn't work like it's supposed to. But just give it a little bit of a break in time and you guys should be fine. Everything else on the shoe is good. Just keep in mind there is also a little bit of dead space up in the toe box area. But going down half size should keep it very, very minimal. Overall, I'm pretty happy with the performance of the Dame 5. So if you all want to pick up a pair, I would say go for it. Dame Dolla doesn’t mess around. No frills, not too pricey, not full of a bunch of marketing BS. No pegboard lace system, no Continental rubber outsole, no Primeknit, because none of it was ever needed; Get the basics down and you have great shoe. Thank you Adidas and Dame! Is this the best Dame ever? Yes, I’d say so because Adidas finally got the right combo of everything especially the traction. (Finally!!) but it isn’t for players who want or need more cushioning. Half a size down will work for almost everyone so buying online won’t be too risky. Even half a size long, I had no issues which is what any good fitting shoe be able to do. I also think I enjoy playing in it because it feels almost exactly like the Marquee Boost but with Bounce instead of Boost. The uppers might look different but they all really have the same function regardless of looks. If you love Dame, you’ll love this shoe. The Dame 4 was titled the best Damian Lillard basketball shoe when it came out. Now that the Adidas Dame 5 is out, it takes over that leading title. These newly released Adidas basketball shoes are said to have the combined attributes of the Dame 2, 3, and 4. It carries a full-length Bounce cushion for a great responsive experience. The herringbone pattern on the shoe’s outsole is the first in Dame Lillard’s line. Regardless of how clean or dusty the court is, the traction works likes a champion. It just grips courts well. The upper is either made of mesh and suede, or full-length leather. Cushion. Just like the previous Damian Lillard basketball shoes, these Dame 5 shoes come with full-length Bounce. The responsiveness, impact protection, and energy return delivered by the Bounce cushioning absolutely meet Damian Lillard’s unique needs. Traction. Depending on the colorway, these Dame 5 shoes come with light gum, gum, or solid rubber outsole. It boasts the trusted multidirectional herringbone traction pattern. Dusty courts are not a hindrance to the beastly performance of these Damian Lillard basketball shoes. Length and Width. The Dame 5 comes in the standard Adidas length and width. When it comes to the actual sizing, there are mixed reports from wearers. Some say it is true to size; some say it is long and wide. New buyers are advised to fit the shoe in-store. Lockdown. To keep the foot in place, both sides of the Adidas Dame 5 have a thermo polyurethane panel. The lateral panel is designed to be wider and larger to provide ample support. This also helps prevent foot slippage. Depending on the colorway, the Adidas Dame 5 comes in either of the two sets of uppers. Buyers can choose between the full leather, or the mesh and suede combo. The tongue, ankle collar and inner walls of the Dame 5 are nicely padded for good and comfortable support. The sides of the shoe come with wide outriggers. These provide stability to prevent ankle rolls. The Adidas Dame 5 has a mid-top silhouette. With over nine colorways to choose from, wearers can enjoy mix and matching their style with the Dame 5. These Adidas basketball shoes look great with basketball jerseys as well as long and short pants. The fifth Damian Lillard basketball shoes are currently available in a range of colorways. Each colorway comes with a story and is briefly described below. Who says NBA stars do not roller skate? Spare Dame Lillard. This young man has plenty of talents outside the courts of the NBA. During off-season, Dame hosts special events on roller rinks. One of them is the launch of his Dame 4 Glow in the Park colorway in November 2017. To honor Oakland’s skate culture, the All Skate colorway of the Dame 5 features a white upper with a red ankle collar. The multi-colored solid rubber outsole is filled with yellow green, shock red, and white hues in a camouflage-like pattern. The Adidas Dame 5 All Skate is set to release on February 1, 2019. The CNY colorways are available in Beijing, China in the first week of January of 2019 for the celebration of the Chinese New Year. The heel has the Adidas callout and logo. Below this is the “REN ZHE” callout and its equivalent Chinese character. In the Chinese culture, Ren Zhe means ninja and it pertains to Dame Lillard’s moves on court. On Martin Luther King Day, Damian Lillard wore the Dame 5 CBC colorway. CBC means Celebrating Black Culture. The shoe comes in the Core Black/Shock Red/Active Purple combination. The heel comes with the “YKWTII MC CBC” callout. Prior to the official US release of the Adidas Dame 5, the CBC colorway is already available in Asia. When Dame Lillard was a kid, his favorite bike was stolen. Luckily, he was able to get it back. Lillard said, “Somebody stole that bike, and I went searching. We went around the neighborhood and found it. You ain’t keeping this one. That’s ours." The bright yellow, red, and black colors of the that Mongoose bike are now the colors of the DameGoose colorway. The Adidas Dame 5 DameGoose is scheduled to release on April 5, 2019. “La Heem is my alter ego. It’s a Muslim word, but it just started cause my cousin would always say La Heem. It [represents] the best of the best. It’s a Muslim word that means to be ahead of or to be passing. It’s kind of [become] my thing. It’s like everything else I do, I’m La Heem.” This is how Dame Lillard describes his self-esteem. The black and white shoe is accented with gold in the midsole. The Adidas Dame 5 La Heem, The Dream is released on May 3, 2019. Every NBA player has off-court interests and they dedicate specific colorways to celebrate them. Kyrie Irving’s off-court pastime is to play video games, thus the PlayStation x Nike PG 2.5 colorways. 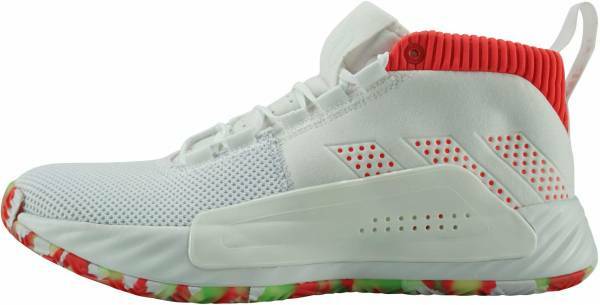 As for Dame Lillard, he has the People’s Champ colorway that symbolizes his passion for boxing. The all-black shoe has on the midsole red details that are inspired by the Rip City colors. The heel has the “YKWTII MC PEOPLES CHAMP” callout. It comes with a mesh and suede upper, and a solid rubber outsole. The colorway is set to release on February 1, 2019. It is not uncommon for successful NBA stars to dedicate a colorway for the important women in their lives. LeBron James shows love for his mother with the Gloria colorway. Derrick Rose has the Brenda colorway. As for Damian Lillard, he honors his mom Gina through the Suga Gee colorway. This rendition of the Dame 5 shoe features different shades of green, which is one of her favorite colors. The Adidas Dame 5 Suga Gee is released on March 1, 2019. You know what time it is (YKWTII)? It’s Dame Time! Dame Lillard is known for his ability to hit clutch shots. The Portland Trail Blazers can depend on Lillard to score in crucial moments to win the game, reach a tie, or cut the lead. The TKWTII shoe has a clean white upper with a black tongue and ankle collar. The white midsole is detailed with black ripples. This version is complemented by a mix of pink and white on its solid rubber outsole. The Adidas Dame 5 YKWTII is released on February 1, 2019.